We return to the ever-confounding law of cases involving injuries caused by animals. Our February 2017 entry stated that New York does not recognize a cause of action for negligence for injuries caused by a dog or by any other animal. That means that in order to successfully sue a dog owner for injuries caused by a dog – it doesn’t necessarily have to be a bite – one must prove that the owner knew or should have known that the animal had prior vicious propensities. 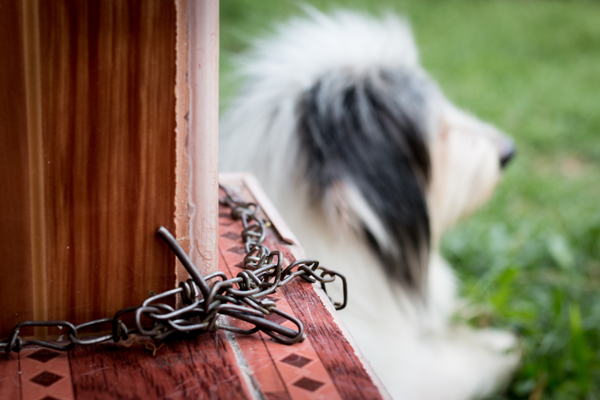 A lawsuit based upon an owner’s mere negligence – failure to leash a dog, for instance, or a dog running out of the house due to someone’s careless behavior – will almost certainly be dismissed. Only an owner’s knowledge of a dog’s prior vicious propensities will lead to liability. The rule is clear, and it is firm. But – what about someone who is injured by a dog as a result of the owner’s negligence, when that injury is not the result of a direct attack? Recently, a New York Appellate Court (the First Department, which hears appeals from the Lower Courts in New York and Bronx Counties) had before it a case where a man tied his 35 pound dog to a metal bicycle rack – you’ve certainly seen these racks yourself, outside of a store or restaurant. The problem was that the rack was not secured to the ground, and the dog tried to follow its owner, but became spooked when it heard the sound of metal scraping against the sidewalk. The dog took off (the Decision says “very fast”). The owner ran after the dog, but was unable to catch up to it. At that point, Mr. Gregory Scavetta, who was on his way to work, heard the scraping of the rack, and saw the dog running straight toward him. The dog ran past Mr. Scavetta, and hid underneath a car (perhaps further evidence that it was afraid, and not acting in an aggressive manner). Mr. Scavetta stepped toward the dog to see if it was injured, and whether he could disconnect the rack from the leash. The dog then ran back out from the car, toward Mr. Scavetta, whose leg got caught in the rack’s crossbars. As the dog continued to pull the rack, Mr. Scavetta was spun around, lost his balance, and landed on his back, sustaining injuries. A lawsuit against the owner followed. While we can’t be sure, it seems pretty clear that Scavetta’s attorney tried to carve out an exception to the vicious propensities rule, since the papers before the Court specifically stated that the case did not involve the dog’s vicious propensities. Instead, it was claimed that the owner knew or should have known that the dog could easily drag the light bicycle rack, and turn the otherwise innocuous metal rack into a dangerous instrumentality. We tip our hat to Mr. Scavetta’s attorney for a great attempt to finally carve out an exception to an antiquated law – but the Lower Court still dismissed the case. The Lower Court’s decision was affirmed by the First Department, so Mr. Scavetta remains defeated. The interesting part of this story is the wording of the First Department’s Decision and Order, where the Court expressly stated that were it not constrained by the harshness of the above rule, it would permit Mr. Scavetta to pursue his negligence claim. The Court didn’t even espouse the wholesale abandonment of the prior vicious propensity rule. Instead, the First Department itself proposed an exception: that a dog owner who attaches his or her dog to an unsecured, dangerous object, allowing the dog to drag the object through the streets and cause an injury to another, may be held liable in negligence. What the First Department essentially did was to propose an exception limited to these particular (and unusual facts). Mr. Scavetta’s attorneys have appealed this case to the Court of Appeals, New York’s highest Court. If the New York law concerning dog bites is going to change, it’s going to change in the Court of Appeals. Mr. Scavetta’s brief is due on July 22, 2017 – stay tuned, and we’ll report on the outcome. The White Plains personal injury attorneys at Worby Vecchio Edelman handle all types of injury cases, including those caused by animal bites. Call us if you’ve been injured in any type of accident. Don’t wait to do so, because some types of cases have very short deadlines. We work on contingency, so you won’t be charged a fee unless and until you get money on your case.